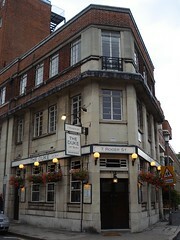 A small pub with attached dining room in the backstreets between Southampton Row and Gray's Inn Road. Furnished in dark wood with a few booths, black and white prints of film scenes, actors and actresses, and a couple of red formica topped tables. It is quite pretty. They have a small range of beers on, including a couple of real ales (Broadside [off] and Greene King IPA on Billy's last visit) which were quite well kept and Staropramen. The red wine was also quite nice. Prices come in at around £3 a drink. They bill themselves as a gastropub and the menu backs this up, with a "Fish of the Week", interesting soup and fancy burger. They do Sunday Roasts on Sunday, which are quite big and tasty, but nothing too special. Starters are about £5 and mains £10-£15. They also have a rather excellent old bakelite telephone with proper loud ringing bell, which looked and sounded quite excellent. It's a bit hidden, although there is a small sign on Guilford Street, at the top of Doughty Mews. secretlondon visited in December 2008. It was very dark. They had 2 beers on and the Broadside was ÃƒÂ‚Ã‚Â£3.30 a pint. I had the steak for photo for ÃƒÂ‚Ã‚Â£18.95. They had 2 choices of dessert but both looked uninteresting. Accessibility: One step to enter. Last visited by secretlondon, December 2008. Last edited 2013-05-10 07:06:41 (version 13; diff). List all versions. Page last edited 2013-05-10 07:06:41 (version 13).